The first motorway in the world: The AVUS (Automobile Traffic and Exercise Road) is a former long-distance racing track that today forms the northern part of the federal highway A115. Germany's legendary race track was opened almost 100 years ago and was then the fastest race track in the world. The famous adjoining grandstand in Charlottenburg at the Messedamm exit is one of the most popular sights of Berlin and a historical landmark. For many, it is one of the first impressions entering Berlin. It is also called the "gateway to Berlin". Halenseestraße 47/51, administrative building with restaurant and observation tower, now resting place AVUS, 1936 by Walther Bettenstaedt; conversion 1977 by Gerhard Rainer Rümmler; spectator grandstand, 1936-37 by Fritz Wilms and Walter Bettenstaedt. The AVUS, which was opened in 1921, is the world's first motorway, was used as a race track until 1999, and its legend is unbroken. Its history is known world-wide and Berliners have embraced it as their own. Its condition is in need of renovation. The grandstand is now looking for a new use. An interesting field of mobility spans from history to the future here! 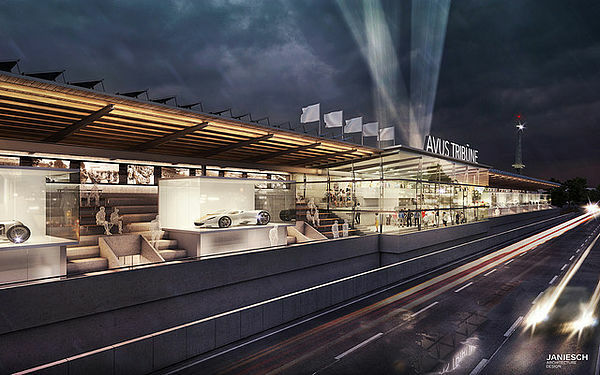 In 2021, the AVUS will celebrate its 100th birthday. The historical structure of the grandstand will be preserved and remain an integral and visible part of the concept. The one hundred year history of the Avus is illustrated by "Old and New", whereby the new elements will stand out clearly. Cautious intervention will be made constructively at locations to enable the building to be used in the future, but without losing its "face". The middle section of the pulpit will be closed by three-sided glazing and will be upgraded to make an event area. On the grandstand, glass boxes will be installed for the presentation, which will direct natural light into the ground floor in order to make use of the underlying surfaces. 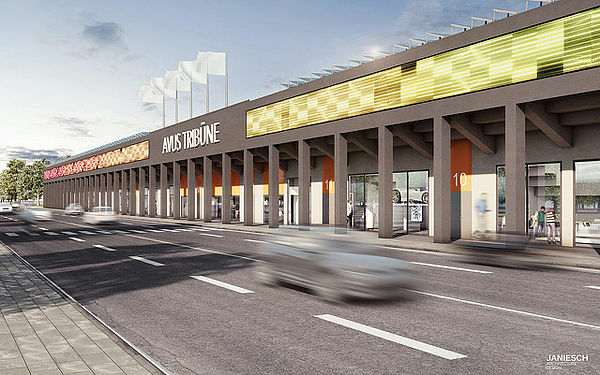 On the ground floor there will be a mix of office space, cafés, shops and possibly an Avus Museum. Large-area window openings to the Messedamm will be fitted into the existing structure and increase transparency for the fair. A mechanical aeration and ventilation system with heat recovery will supply the usable areas with air-conditioned air. The grandstand roof will be renovated according to the historical model, restoring the undercover with wooden beams and planks. A section of the grandstand will be restored according to the original model and could be made accessible to the public with guided tours. 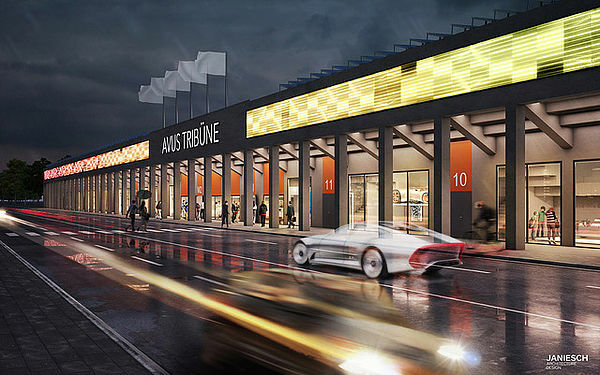 The arcade at Messedamm, as well as the ceiling of the grandstand, will be illuminated indirectly and glare-free to underline the significant effect of the grandstand even in the dark. In view of the future, the involvement of the grandstand in the course of the reconstruction of the Western Cross (cyclocross) or the organisation of a "Formula E" race is desirable. 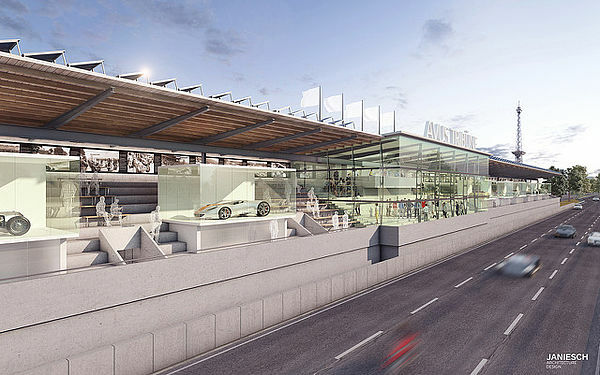 A history monument and symbol for racing history will be marked as a gateway to Berlin.